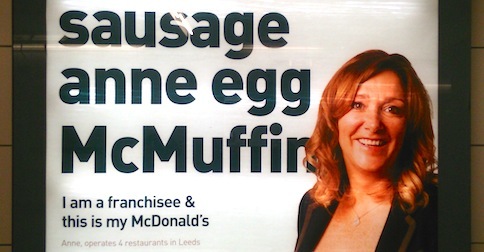 Recently I encountered a poster from fast food chain McDonald’s with the caption ‘sausage anne egg McMuffin’. The Anne in question is a franchisee who operates several McDonald’s restaurants in England. The caption, of course, is a pun on the phrase ‘sausage and egg McMuffin’. It’s a fairly good pun, because the final /d/ of and is usually not pronounced. The pun isn’t perfect, however, because Anne has a strong /a/ vowel, whereas and usually has a weak, colourless schwa, /ə/. Pronouncing and as /and/ in such phrases would be quite unusual, or foreign-sounding. But I sometimes struggle to persuade those I teach that this is true. Many seem to be convinced that /an/, /ən/ and /n/ are lazy or non-standard, and that and ‘should’ be pronounced /and/. So I thought it might be worth listening to and in the Queen’s English, literally. By the way, she has a McDonald’s of her own. I can’t say whether its customers include Princess Anne. 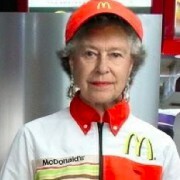 The Queen has bought her own drive-through McDonald’s restaurant, her financial accounts have revealed. 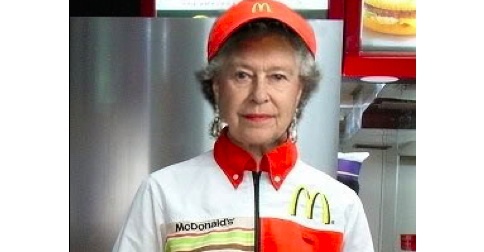 Her Majesty purchased a retail park near Windsor Castle, where the branch of the fast food chain is located, this month. The Bath Road Retail Park in Slough, which is visible from the Queen’s quarters in Windsor Castle, was bought by the Crown Estate for £92million.